Sorry, this item is currently unavailable. Please consider purchasing Salcura Zeoderm Skin Repair Moisturiser Face and Body 150ml instead. Price: £9.49 (incl VAT) Sorry, this item is currently unavailable. Please consider purchasing Salcura Zeoderm Skin Repair Moisturiser Face and Body 150ml instead. A mineral enriched moisturising cream to treat very dry skin caused by eczema, dermatitis, psoriasis and skin allergies. Reduces itching, aggravation and repairs & protects the skin. Free from paraffin, petro-chemicals, steroids, lanolin, alcohol and parabens. 100g tube. Also available in a 250ml tube. Adults and children who suffer with eczema, psoriasis, dermatitis and allergic rashes, may develop dry, scaly, aggravated skin. Salcura Zeoderm contains a mixture of minerals and nutrients which penetrate deep into the skin and offer intensive moisturisation and relief. Zeoderm has been formulated by leading scientists to help promote the renewal of skin cell tissues. This results in strengthened and healthier skin. Itchy, sore break outs should become less frequent as skin is protected. Zeoderm is pH balanced, enriched with moisturisers, omegas, vitamins & minerals and contains anti-microbial, anti-fungal, anti-itch agents. These factors will also help to remove toxins from the skin. Directions: Apply a generous dollop of Zeoderm to the skin. Massage in. Use as frequently as needed. Treatment Tip: When using in conjunction with one of the Salcura sprays apply after the spray has sunk in. Ingredients: Aqua, Silicea* (micronized), Veg. Glycerin, Linum Usitatissimum, Borago Officinalis, Olea Europaea, Simmondsia Chinensis, Urea, Palma Christii, Pelargonium Graveolens, Rosa Damascena, *ZeomaZ ? Tribo Mechanically Activated Zeolite. Product code: SAL740P Price: £9.49 (incl VAT) Sorry, this item is currently unavailable. 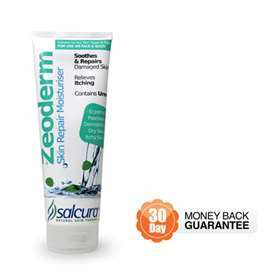 Please consider purchasing Salcura Zeoderm Skin Repair Moisturiser Face and Body 150ml instead.